› Author AffiliationsWe are grateful to the NSFC (#21302173) and Henan Department of Education (#19A150049) for financial support. 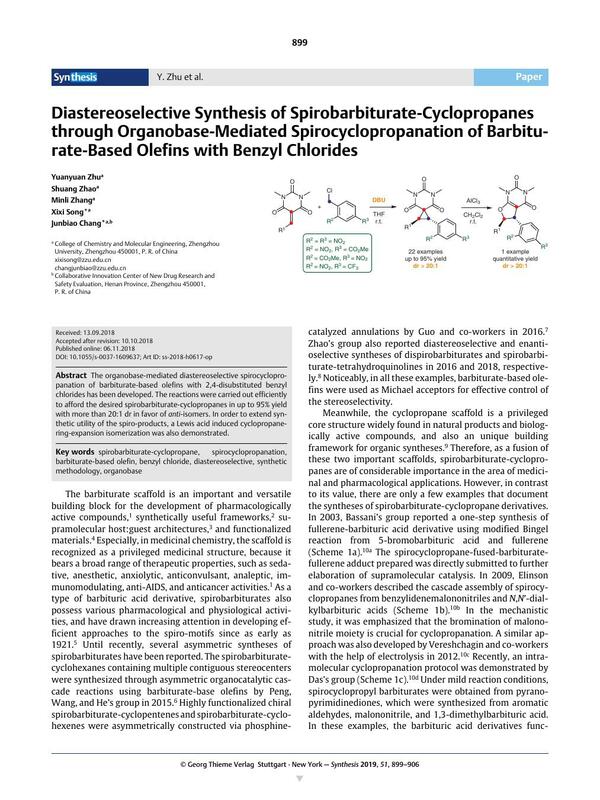 The organobase-mediated diastereoselective spirocyclopropanation of barbiturate-based olefins with 2,4-disubstituted benzyl chlorides has been developed. The reactions were carried out efficiently to afford the desired spirobarbiturate-cyclopropanes in up to 95% yield with more than 20:1 dr in favor of anti-isomers. In order to extend synthetic utility of the spiro-products, a Lewis acid induced cyclopropane-ring-expansion isomerization was also demonstrated. Supporting information for this article is available online at https://doi.org/10.1055/s-0037-1609637. 12a We could not obtain the single-step Michael addition product, which was the protonated form of the intermediate A or B in Scheme 3. The spirobarbiturate-cyclopropanes were the only separable products under various basic conditions in this study. 12b Based on the experimental results, we could not rule out the mechanism of the reaction involving a concerted carbene-based cyclopropanation.